Not high on the tourists list (except for Sevilla city itself) but the land locked province of Sevilla is an important part of Andalucia Region. Sevilla city (the capital of the region as well as the province) sits on the banks of the Rio Guadalquivir, one of Spain's most important rivers, which at this point, sits in a large fertile valley where olive trees and wheat are grown. The guadalquivir valley in this province is also where some of the highest summertime temperatures in Spain have been recorded. 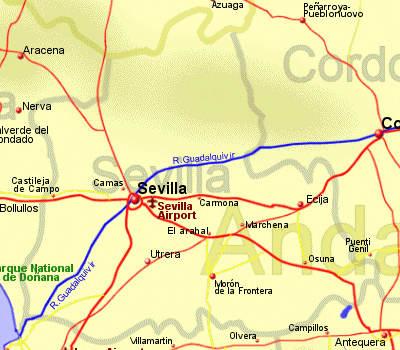 Sevilla province however has a diverce landscape, including part of the Do�ana National Park, one of Europe's most important wetland areas, while part of the Sierra Morena passes through the north of the province where, La Sierra Norte de Sevilla Natural Park is located, a tranquil area with pastures and forests of holm and cork oak. Sevilla is also famous for it's celebrations and partying. Holy Week, or Santa Semana seas religious processions, which is followed by the Feria de Abril, when you will see displays of horsemanship, dancing in traditional colourful costumes, and partying. Sevilla is connected to Madrid the High Speed rail link, the first to be built in Spain, completed for the International Exhibition of 1992, which also saw many other improvements in the city's infrastructure and facilities.